Want to know more about the four types of commercial artificial grass for sports clubs? Want to know more about the four types of commercial artificial grass for sports clubs? One of, if not the most popular use of commercial artificial grass is as the covering for sports pitches. The material’s light weight, easy to install nature, resistance to atmospheric conditions, sturdiness and easy maintenance make it the perfect choice for covering high-traffic surfaces, and sports grounds owners the world over have reaped the benefits of using it in place of natural grass. What most of these owners may not be aware of is that there are, in fact, several different types of commercial artificial grass used as coverings for sports pitches. This article details four of the main ones. Sand-filled commercial artificial grass is most typically used in multi-sport pitches, due to its versatile and space-efficient nature. However, this type of turf will very seldom be found in more specialised professional sports pitches. Water-based commercial artificial grass, also known as ‘no infill’ turf, is popular for reducing abrasion to players upon contact. However, customers should be advised that this type of carpet also requires more frequent wetting than standard turf. Water-based commercial artificial grass is most often found in field hockey pitches. Sand-dressed commercial artificial grass stands out for its heavy weight and density, which allows for much speedier gameplay due to the infill running deeper than on regular sand-filled carpets. These types of turf carpets tend to be particularly suited for hockey or tennis, but are generally considered unsuitable for rugby or senior-level football. Third-generation commercial artificial grass, or simply 3G, uses longer fibres and is typically filled with both crumb rubber and sand. The versatile nature of this surface makes it the most common choice for professional-level football and rugby pitches. 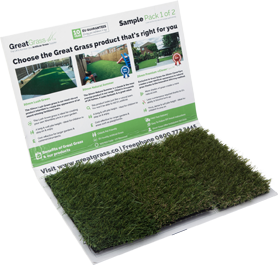 It is important that customers be aware of which type of commercial artificial grass best suits the needs of their sports pitch; fortunately, GreatGrass staff is more than happy to assist with any doubts they might have in this regard!